We are happy to introduce the QCPC Mobile Veterinary Clinic. Our new mobile veterinary house call service brings personalized, professional, veterinary care to your door. Our van is equipped to provide care to multiple pet families, pets that are stressed by the ride to the traditional clinic, and pet owners who prefer the convenience of a home visit. 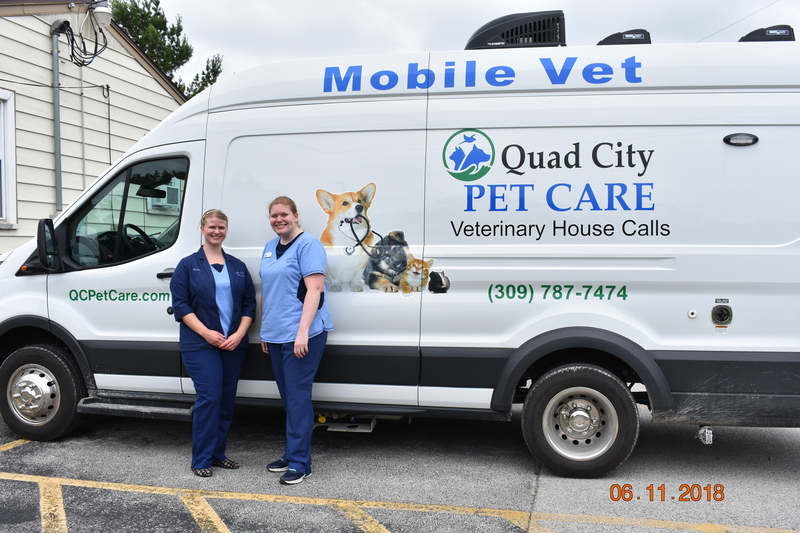 QCPC Mobile vet serves the Iowa and Illinois Quad Cities, including Davenport, Bettendorf, Rock Island and Moline, and the surrounding communities of Scott and Henry Counties. Appointments - The Mobile Vet patients are seen by appointment only. Appointments are made by calling (309)787-7474. We will schedule appointments in a window of time (for example, 1:00 – 1:15). If we are running early or late, we will call and let you know as much in advance as possible. Please have your pet accessible at the time of the visit. Some pets are notorious for hiding when the Veterinarian is on the way. Payment - Payment is due when services are rendered. We accept Visa, Mastercard, Discover, Care Credit, checks or cash. Additional charges will apply to returned checks. Travel Fee - The travel fee is the fee charged to make the house call. The amount of this fee will vary depending upon the distance the mobile vet will travel. It will vary from $25 - $75. This non-refundable fee is collected at the time the appointment is scheduled with our Client Services Representative at (309)787-7474. We accept Mastercard, Visa , Discover and Care Credit.